Imagine a television that wraps around in a cone or that you can stretch across a wall. That's the idea with FLEx Lighting, a new technology that uses LEDs arranged on a roll that can be used for a display in any size or shape. 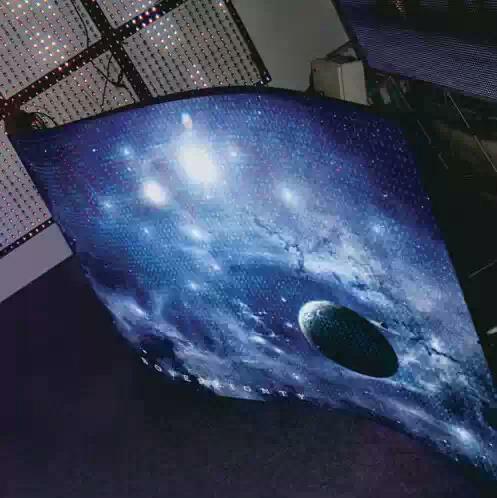 The sheet is less than a half millimeter thick, bends like a thin piece of plastic, and yet has all the qualities for current LED technology: low power, low cost, and long-lasting. So in future we would be having such Televisions which can be folded and can be easily transported from one place to another. Its a great technology that will help the customers to see the high quality images in just a half millimeter thick T.V. But it would be interesting to know its price in market and also I ponder how it will be kept on the tables or can it be Hanged to walls like the photos. LED's are playing a vital role in our daily life now a days and its important to note that LED's have almost replaced bulbs and other light emitting materials that uses a huge amount of electricity.Thanks to LED's and also there producers. Lets wait and watch when this new technology will entertain us with its brand new facilities and ease of keeping it at a place. Meet The Transparent Solar Cell! New Technology Converts Ink Into Sound! Coming soon: Rajinikanth phones, tablets!